You all know I enjoy and will only use organic and natural skincare that is made with safe and natural ingredients. But what makes me love a product even more is when I know where it came from, who made it and the passion behind the product! That is why I LOVE Moody Sisters Organic Skincare! They have brought skincare back to the basics by handmaking each product using only natural and organic ingredients. They even have a cool story behind their products! It all started with two sisters, 10-years apart in age, who grew up in Lake Wenatchee and both settled in Cashmere, WA with their families. The two were quite different in almost all aspects of life, but they shared one common interest; combating the moodiness of their skin. 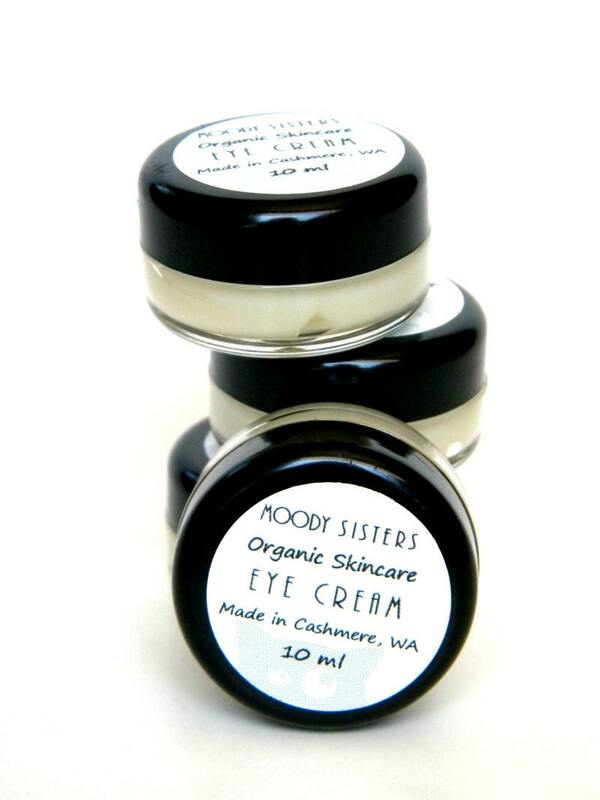 Moody Sisters are two sisters who grew tired of combating the moodiness of their skin and the unreliable ingredients in mass produced skin care products. Together the sisters designed a skincare line to combat wrinkles, acne, dry - sensitive skin and oily skin using natural products and aromatherapy scent combos with essential oils. All of their products are preservative free, paraben free and organic. Being from a family of 5 sisters, I appreciate and love the story of these two sisters working together for a shared passion! The products range from sensitive skin cleansers and moisturizers to acne and oil control. Each product has antibacterial, antioxidant and antifungal properties as well as numerous health benefits from herbal extracts and essential oils. I received two great products from Moody Sisters: The Vanilla Orange Body Wash and the Eye Cream. The Body Wash works for all skin types and cleanses and hydrates your skin while leaving you with a delicious scent! Pour a splash of our body wash into your hands or wash cloth and scrub to FOAM! This wash is loaded with vitamins, herbal extracts and essential oils to give your skin a clean and fresh feel with a scent that will last all day! It can even be used as shaving cream and face wash too! I found that it doesn't foam up that much in a loofah but in your hands it works pretty well. I really wish it foamed up a little bit more in my loofah though because I prefer that method! It is scented with Moody Sister's Essential Oil combo VANILLA ORANGE DELIGHT- A warm delicious scent so sweet you could eat it! This comforting smell has top notes of orange and grapefruit with a base note vanilla. Fight those fine lines and soothe those tired puffy eyes with the all purpose eye cream loaded with age-fighting essential oils and vitamins! The Moody Sister's essential oil age-fighting combo featuring CARROT SEED OIL promotes skin cell growth and healing while the CUCUMBER EXTRACT soothes and reduces eye puffiness. Keep in the fridge for extra pampering! It can also be used as cuticle and nail cream! So if you are looking to find organic skincare that works and also where you know where it came from and how it was made, check out Moody Sisters Organic Skincare for all you needs! Also, any one who becomes a Moody Sisters Facebook Fan can use the coupon code IMAFAN10 for 10% off their entire purchase! And feel free to sign up for their monthly coupon email and follow them on Twitter! Win It: Moody Sisters is generously offering (1) $25 gift certificate to a lucky winner!